Judge Smith ruled that the Da Vinci Code did not infringe on the copyright of the book Holy Blood, Holy Grail, and he issued his ruling with an interesting twist: He inserted his own code into it. Embedded in the first 13½ pages of the ruling is Justice Smith's very own secret code, one that when partly solved reveals its name: the Smithy Code. The code is contained in italics in the text of the opinion, which can be read here. No one has yet solved all of the Judge Smithy code. [Update April 28, 2006] That was quick - the code has been solved. For the answer see the Wikipedia Article on the Smithy Code. In a tragedy in Southfield, Michigan, a 16 month old boy died after a fall from an apartment window. Police have ruled it an accident and a lawsuit by the parents agains tthe compex is likely. The toddler's parents have quite typical names: Jennifer Holmes and Andrew Pitts. The name of the child? Story from the Detroit Free Press. Both the Detroit news and The Detroit Free Press offer front page coverage of the imminent release of the United 93 movie. The Detroit News: 9-11 Are we ready to relive it? Both papers are concerned that the nation may not be ready -- 5 years after the terrorist attack to be exposed to a representation of what happened. I think the "nation" can handle it. Heck after constant caterwauling in the media about Afghanistan and Iraq perhaps it will be a useful reminder to some as to Why We Fight the Islamist-terrorists over there rather than waiting for more attacks here. I'm glad to report that I've passed the classroom and confined water portions of the PADI Open Water Diver program with swimming colors. I took the class with Sea The World Scuba Center. The instruction was first rate. We had a class of 4 new Open Water students and one student taking it as a refresher class - They were a great bunch of people to learn to dive with. The instructor's name was Charlie F. and he was truly excellent both in getting concepts across in the classroom and helping students learn techniques in the pool. I will do my open water portion with him in May, and once I get my Open Water C-Card I will go for my Advanced Open Water. The class was a lot of fun. The initial 200 yard swim and 10 minute treading water was a thrill most of us could have done without. But from that humble beginning as incredibly clumsy neophyte divers in the water we got better and better and were soon doing mask removals and clears underwater, and hovering with relative ease. The class has been great so far and I look forward to my open water dives. the Author of Shadow Divers . It was Meet the Author Night sponsored by my local library - the excellent West Bloomfield Township Public Library. Along with other Libraries in the area, the WBTPL had organized a "What Everybody's Reading" program where everyone reads and discusses the same boook and many events are planned around it. 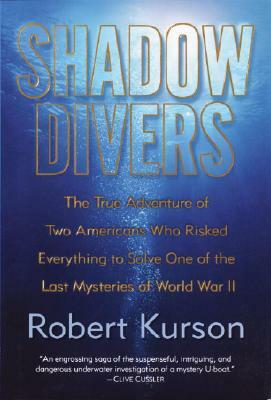 Shadow Divers was the book chosen and it was a fantastic choice. 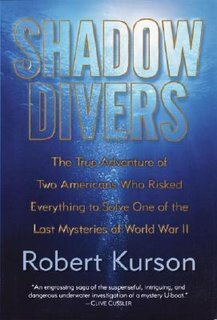 Mr. Kurson is a masterful story teller, and the material for his true story is top rate - how Recreational Scuba Divers found a U-Boat, 60 miles off the coast of New Jersey in 230 feet of water that no one knew was there. The story of the discovery, and the six year long adventure of diving and identifying the wreck as the U-869, is told in a way that appeals to divers and non-divers alike. The meeting was well attended and Mr. Kurson is a very engaging speaker and gave an excellent telling of how he came to write the book, his experiences with the two main divers in the story, - John Chatterton and Richie Kohler- and his own hilarious and very short foray into scuba diving. Mr. Kurson also took the time to sign books and chatted engagingly with each person whose book he signed. I highly recommend the book -- it was a driving factor in my getting into Scuba diving and is a fantastic can't-put-it-down read. In addition, a movie based on the book is due to come out in 2007 to be directed by Ridley Scott.